The history of hurling in Ireland is centuries old and can be traced back through early written stories of Irish lore. The popular field sport has made its way over here and gained a strong following in the Missoula valley. 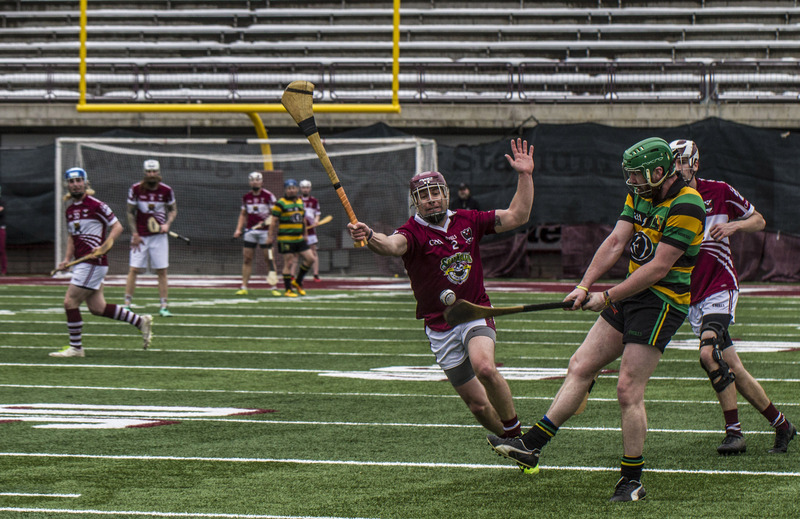 You can catch the Griz Hurling Team and the Thomas Meagher Hurling Club going head to head during the Fall and Spring, as well as the Griz going up against other teams in the Northwest. For more information on practices, games, and upcoming events, contact team leader Tanner Sholey at tsholz32@gmail.com. The Éire Óg youth hurling team continues to meet and train at Missoula International School [Prescott Elementary] on Harrison Street every Wednesday at 6:00 pm and every Saturday at 2:00pm. This is a very dedicated group kids working with a trained coach, Pa Sheehan. We are always looking for new kids to join in. So, if you have kids or grandkids, encourage them to take a look. You can contact Cara Shea at carashea240@gmail.com for more information. That great Irish game of handball is making a comeback! Some well-known Irishmen and women from the community have joined together to build a complex for handball and racket ball. Members of this group have also discussed the possibility of reforming the University of Montana handball club. This is very exciting for us. Can you imagine a university offering activities and courses in hurling and handball. Well, imagine no more, because if I know these guys, they will make it happen. If you’re interested in learning about or helping with their current project, please contact Tom Sullivan at tsullivan@mt.gov.